People run for cover after they were rescued from the Dusit complex in Nairobi on January 15, 2019. 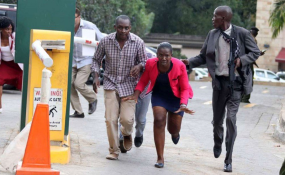 Police are closing in on more suspects believed to have played part in the terror attack at 14 Riverside Drive Complex, after the arrest of 9 on Thursday. The new arrests brings to 11 the number of suspects taken in so far - and includes Ali Salim Gichunge - the main planner earlier thought to have been killed when the Tuesday attack was staged, killing 21 people. The attack was staged by five terrorists and all died - one having blown himself up while four were shot dead. The senior police officer briefed on the investigations progress said detectives were convinced that Gichunge was dead, after his neighbours reported that the vehicle that ferried terrorists there belonged to him. "He is in custody, there must have been confusion because his vehicle was at the scene," a senior police officer said, but referred us to the Directorate of Criminal Investigations (DCI) for further details, "it is a very sensitive investigation, and we are not allowed to speak much about it." Gichunge, who is also known as Farouk from Isiolo, is the owner of the house in Ruaka that was raided by police soon after the attack, and is in custody alongside his wife Violet Wanjiru aka Kemunto who publicly identifies herself as an Al Shabaab bride, according to her neighbours and friends. The rest of the suspects were arrested in Nairobi, Mombasa and Western Kenya--having been linked to the attack from their constant communication with terrorists, including in Somalia. When asked about the arrests on Thursday night, Inspector General of Police Joseph Boinnet said he can only confirm the arrest of seven suspects, and declined to comment further on other arrests. "The total number of suspects arrested is 7," he said, and did not respond further when asked about Gichunge's fate. The DCI director George Kinoti remained carefully guarded on the information he releases to the media, after confirming the arrest of two people he described as "principal suspects" on Wednesday, a day after the deadly attack that has exposed the country's security gaps, coming 6 years after the Westgate attack that claimed 67 lives. Kenya also suffered another attack on in 2016 at the Garissa University where 148 people were killed. Among the dead in the Tuesday attack are 16 Kenyans, an American, a Briton and three people whose nationalities were yet to be established, according to the IG. The management of Dusit Hotel on Thursday said they lost four employees in the Tuesday terror attack, and three were injured out of the 100 who were on duty. The Kenya Red Cross on Thursday announced that all the people reported missing after the attack had been accounted for, effectively bringing to an the search mission.